J.P. Morgan Asset Management is a worldwide but tightly-knit investment specialist. We offer a range of flexible investment solutions, including one of the world’s most comprehensive ranges of investment products. Investors in UK equity funds often desire differing outcomes and have varying appetites for risk. J.P. Morgan Asset Management's range offers a wide choice of objectives and strategies but all are based on our proven behavioural finance process. Behavioural finance defines and measures human behaviour on the academically robust principle that market inefficiencies are usually due to irrational investor behaviour. As a result, we can find and exploit opportunities that arise from that behaviour and invest in them, often when others do not. Our UK equity team based in London is led by 41 Investment Professionals with 13 years average experience, 11 years of that spent at J.P. Morgan. Note: Risk/return positions are illustrative of expected longer term returns and volatilities of strategies. Offers investors exposure to the best investment opportunities from across the UK equity market. A ‘go anywhere’ fund that can offer broad exposure to companies of all sizes. Invests in stocks that have the most appealing combination of value, momentum and quality characteristics and that the managers believe will outperform in the short, medium or long term, irrespective of their benchmark weighting. Aims to provide capital growth and outperform the FTSE All - Share Index over the long term by investing primarily in UK companies. Combines the breadth of coverage of our daily market modelling with the stock picking skills of our UK team to provide consistent performance with limited risk. All at a passive price: 40bps OGC. Aims to provide long-term capital growth through direct investments in UK companies and through the use of derivatives. In addition to taking long positions in the stocks we like the most, the fund also takes short positions in stocks we believe will underperform. 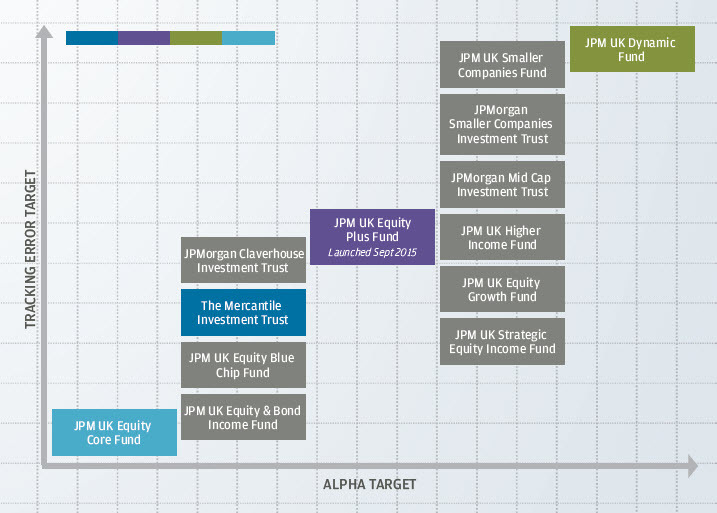 JPM UK Equity Plus is the newly-launched UK version of JPM Europe Equity Plus, an active extension fund with a solid long-term track record. Discovering tomorrow’s market leaders: invests in UK companies predominantly outside the FTSE 100 with established track records and with significant room for growth. Allows investors access to exciting companies that often lack liquidity. Access to our best ideas and active management at less than 50bps OGC. Stable and experienced management team that bring experience, vision, insight and above all passion to this dynamic area of the market. "We bring experience, vision, insight and above all passion to this dynamic area of the market to discover the success stories of tomorrow"
FOR PROFESSIONAL CLIENTS ONLY | NOT FOR RETAIL USE OR DISTRIBUTION.